This week marked a major milestone for our client Jim Beam® Bourbon, filling its 15 millionth barrel of bourbon since the end of Prohibition. 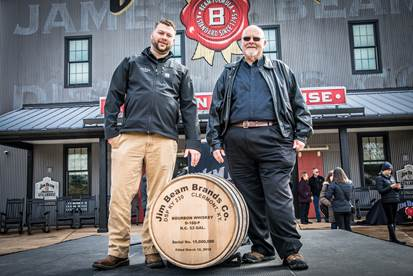 The milestone barrel — a first for Kentucky distilleries — was personally filled and sealed by Seventh Generation Master Distiller Fred Noe and his son Freddie Noe, Eighth Generation Beam Distiller, at the brand’s flagship distillery in Clermont, Ky. The historic barrel, filled less than two years after the filling of Jim Beam’s 14 millionth barrel, will join the nearly 2.3 million barrels of bourbon currently aging in Jim Beam’s rackhouses. With some help from LCWA, the historic milestone generated both local and national media attention, touting Jim Beam’s heritage and further positioning the brand as a category leader. FOX, ABC and NBC news crews covered the event in person while stations across Kentucky pulled b-roll that included interviews with Seventh Generation Jim Beam Master Distiller Fred Noe, footage of the final barrel fill and bourbon fans toasting the occasion. Furthermore, the story was picked up by a number of target daily newspapers, bourbon trades and the Associated Press (driving an additional 650+ placements and eventually landing right back on our desks in the Chicago Tribune). The success of the event is a testament to the continued popularity of the bourbon industry, and a little elbow grease from us here in Chicago. Cheers!